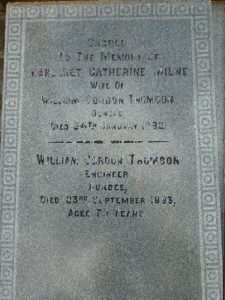 William Gordon Thomson was a successful engineer, ironfounder and, latterly, also mill spinner. His years spent as a partner in the firm of John Kerr & Co at Douglas Foundry, gained a profound respect from his contemporaries. The 1841 census for Dundee showed William Gordon Thomson, aged 18, to have been living with his mother at King Street. At that point, he was declared as having been an 'apprentice engineer.' Further to that, his obituary reported that he had 'served an apprenticeship in the old Wallace Foundry which, at the time, belonged to the celebrated firm of Messrs Kinmond, Hatton & Steel.' During the 1840s, William G Thomson spent some time in London, under the auspices of an eminent engineer, as a draughtsman. On his return to Dundee in 1849, he entered into partnership with Messrs John Kerr & Co at Douglas Foundry in Blinshall Street. This was shortly after the dissolution of 'Umpherston & Kerr,' brought about by the death of William Umpherston in 1846. 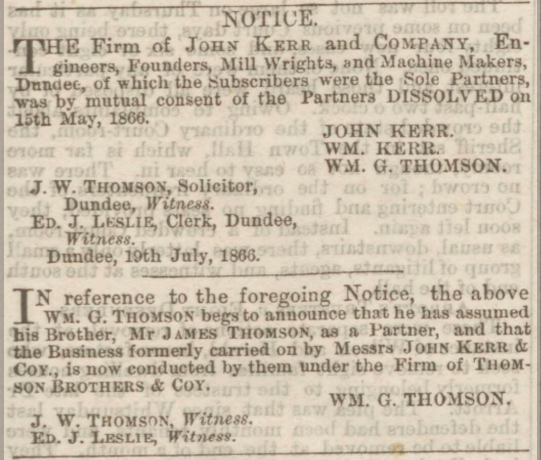 The senior partner, John Kerr, had also assumed his brother, William Kerr, to become a third partner in the newly founded business of 'John Kerr & Co.' The firm carried on a most extensive business, Douglas Foundry being declared as 'one of the largest and most successful engineering establishments in this place (Dundee).' The dissolution of the firm in 1866 was brought about by the retiral of the Messrs Kerr. William Gordon Thomson was the son of James Thomson, an architect, and his wife Mary Gordon. James Thomson had moved to Dumfries to convert the chapel in Buccleugh Street into a courthouse. He also designed various, simple churches within Dumfriesshire. William’s father, having died of cholera in 1832 at Dumfries when he was merely 12 years old, William and his widowed mother subsequently made their way to live and work in Dundee. Perhaps this had been a move for opportunities and to be closer to relatives, his mother, coming as she did, from Fordoun in Kincardineshire. They had established themselves in Dundee by 1841. William’s oldest brother, George, also an engineer, had married in Manchester in 1837 but died at Poona in 1842. Another brother, James, was manager of Broadford Works in Aberdeen. James was later to join with his brother in Dundee at Douglas Foundry. 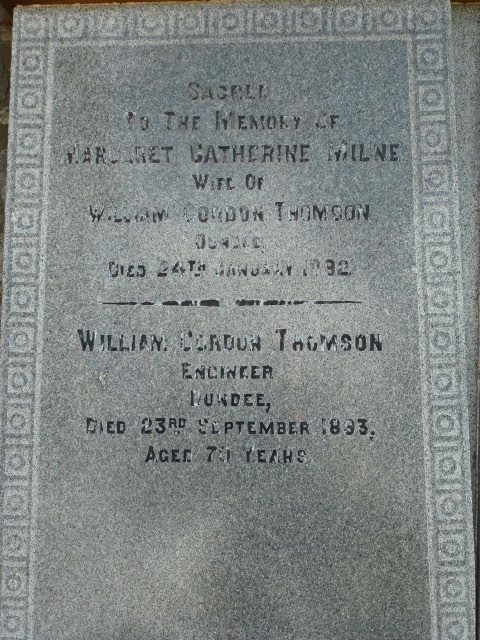 In 1853, William Gordon Thomson wed Margaret Catherine Milne, the sister of his brother James’ wife, Elizabeth Milne. 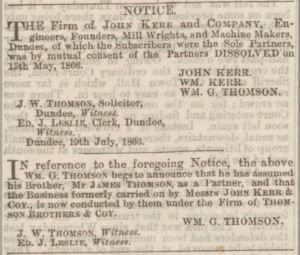 On the dissolution of ‘John Kerr & Co’ in 1866, brought about by the retiral of the Kerr brothers, John and William, William Gordon Thomson was joined by his brother James, the business continuing under the title of ‘Messrs Thomson Brothers & Co.’ A further change came in 1878, when the brothers were joined by William’s son, Alexander Gordon Thomson, to become known as ‘Messrs Thomson & Son & Co,’ with William Gordon Thomson being the senior partner. The lease of the ground at Blinshall Street expired in 1889 whereupon, ‘new buildings of a modern type’ were erected on ground feued at Clepington Road, on the south side of the new Suburban Railway. From there, the firm continued to do a large business, principally in mill gearing, jute machinery, cloth finishing and hydraulic work. It would appear that having long manufactured machinery for the jute trade, William Gordon Thomson looked to diversify his interests during the 1870s. He became the sole partner of the ‘Clepington Spinning Company’ which was established in North Isla Street in 1873/74. 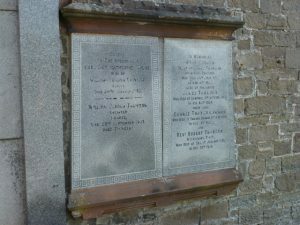 William Gordon Thomson, engineer, iron founder and mill spinner died at his residence, ‘Fairfield‘ (a now listed building, situated at 7 Fairfield Road, West Ferry), survived by his son, Alexander Gordon Thomson, who had been associated in business with his father from 1871. Scotland Select Births and Baptisms, 1564-1950. FHL Film No. 1067961. Ref ID. 2=161KCBT. Ancestry website. Census Returns. Dundee. (1851). 282/ 84 2. ScotlandsPeople website. Census Returns. Dundee. (1891). 282/4 48/ 4. ScotlandsPeople website. Old Parish Registers. Dundee. Marriages. (1853). 282/ 230 469. ScotlandsPeople website. Old Parish Registers. Dundee. Births. (1854). 282/ 200 159. ScotlandsPeople website. Census Returns. Dundee. (1841). 282/ 91/ 15. ScotlandsPeople website. Scottish Post Office Directories. Dundee, 1850. p.166. Dundee Central Library, Local Studies. Scottish Post Office Directories. Dundee, 1853-54. p.223. Dundee Central Library, Local Studies. Scottish Post Office Directories. Dundee, 1856-62. Dundee Central Library, Local Studies. Scottish Post Office Directories. Dundee, 1864-65. p.195. Dundee Central Library, Local Studies. Scottish Post Office Directories. Dundee, 1869-70. p.223. Dundee Central Library, Local Studies. Scottish Post Office Directories. Dundee, 1871-72. Dundee Central Library, Local Studies. Statutory Registers. Dundee. Deaths. (1893). 282/4 937. ScotlandsPeople website. Dundee Advertiser. 25 September 1893. p.6. British Newspaper Archive website. Scottish Post Office Directories. Dundee, 1861-62. p.218. Dundee Central Library, Local Studies. Dundee, Perth & Cupar Advertiser. 22 May 1846. p.3. British Newspaper Archive website. Montrose, Arbroath & Brechin Review. 18 September 1868. p.7. British Newspaper Archive website. Dundee Courier. 23 October 1863.p.3. British Newspaper Archive website. Dictionary of Scottish Architects. via scottisharchitects.org.uk website. Legal Records. Wills and Testaments. Dumfries Sheriff Court. (1834). SC15/ 41/ 5. ScotlandsPeople website. Manchester Times. 16 September 1837. p.3. British Newspaper Archive website. Dundee, Perth & Cupar Advertiser. 2 May 1848. p.3. British Newspaper Archive website. Dundee Evening Post. 22 January 1904. p.5. British Newspaper Archive website. Legal Records. Wills and Testaments. Dundee Sheriff Court. (1893). SC45/ 31/ 45. ScotlandsPeople website. Watson, Mark. Jute and Flax Mills in Dundee. (1990). Tayport. Hutton Press. p.200. Many thanks to Lily, Hugh and the staff of the Local History Department at Dundee Library for their help. The information above about William Gordon Thomson has been collated from a range of digital and hard copy sources. To the best of our knowledge it is correct but if you are relying on any information from our website for the purpose of your own research we would advise you to follow up the sources to your own satisfaction. If you are aware of an inaccuracy in our text please do not hesitate to notify us through our Contact page.